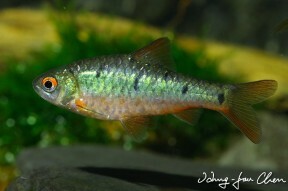 The wild form of this species is arguably among the most-attractive small cyprinids. The 'golden' strain does not occur in nature but is a popular aquarium subject. At this locality in southern China 'P.' semifasciolatus was collected with Macropodus and Liniparhomaloptera sp. Wild specimen from southwestern China. Female of the ornamental strain. 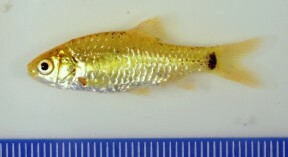 Subadult specimen from the aquarium trade. 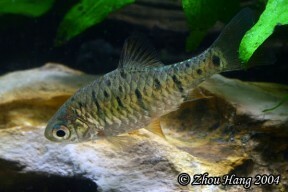 Adult female from the aquarium trade. Adult pair - nuptial male at bottom. semifasciolatus: from the Latin semi, meaning ‘half’, and fasciolatus, meaning ‘with small bands’. Occurs throughout Vietnam, Taiwan, and southwestern China and northern Laos, and has also been recorded in Russia though it’s unclear whether the latter population is naturally-occurring or not. Type locality is given as ‘China’ but the type specimens appear to have been collected from the Red River drainage (probably the northern Vietnam section although the river originates in Yunnan province, China), and occurence records show that it’s also been collected from numerous other localities in northern Vietnam, the Chinese provinces of Guangxi and Guangdong and the islands of Hainan, Hong Kong, and Taiwan. Information pertaining to Laos is scant but the species certainly occurs in the Nam Ou river watershed, Phôngsali Province. In Taiwan the species is known to be at risk through habitat loss/degradation and the introduction of exotic species, while feral populations exist in both Singapore and Hawaii. Appears to display a preference for slower-flowing tributaries and standing water bodies such as swamps and irrigation channels and is fairly ubiquitous in such biotopes across its range. It’s typically associated with areas of dense aquatic or riparian vegetation and forms schools close to the substrate. 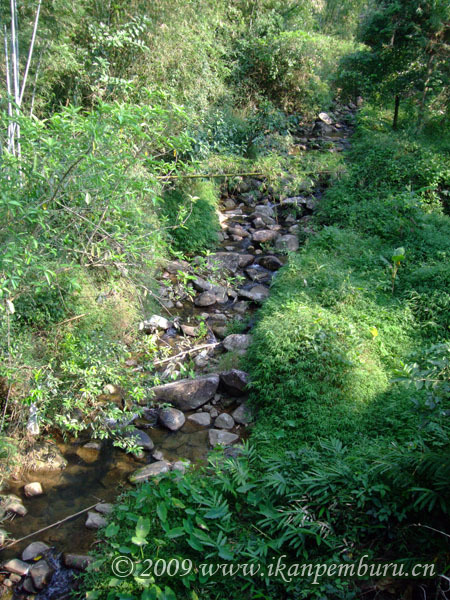 At a typical stream locality on Hainan Island the water was around 1 metre deep with temperature 31.9°C, pH 8.0, conductivity 102 µS/cm, GH 2, and kH 2 in March 2006. 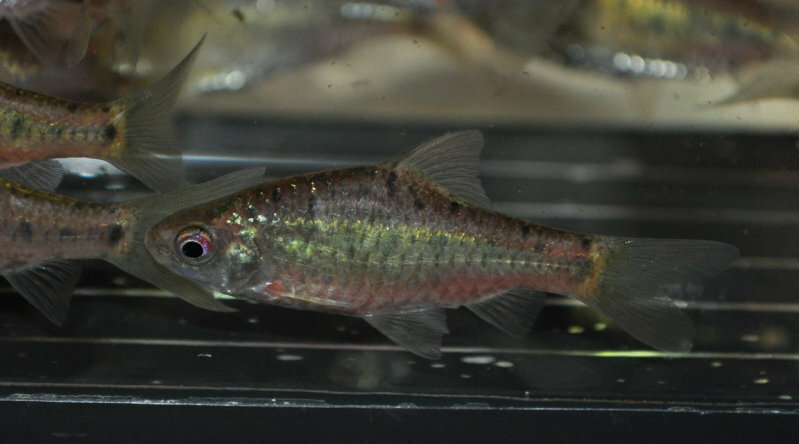 Sympatric species included Rasbora steineri, Macropodus opercularis, Doryichthys sp., and Metzia spp. with several species of shrimp from genera such as Macrobrachium and Neocaridinia also present. Base dimensions of at least 90 ∗ 30 cm or equivalent are required. The golden form (see ‘Notes’) is among the hardier, most undemanding species available in the aquarium hobby and as such is a good choice for beginners. A foraging omnivore feeding mostly on benthic diatoms, algae, organic detritus, small insects, worms, crustaceans, and other zooplankton in nature. 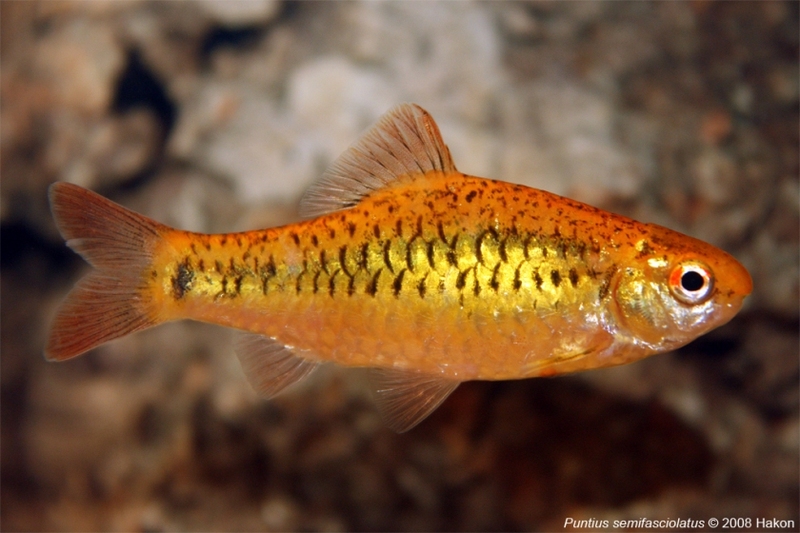 Fishes inhabiting similar biotopes in nature, especially comparably-sized, peaceful cyprinids perhaps constitute the best choices but other potential options include balitorid, cobitid, and nemacheilid loaches as well as benthic cyprinids such as Crossocheilus and Garra species. 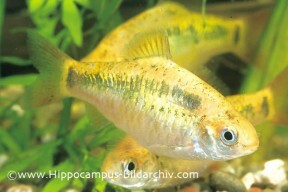 Adult females tend to be rounder-bellied and grow slightly larger than the males. In the natural colour form sexually mature males develop red pigmentation in the lower portion of the body. 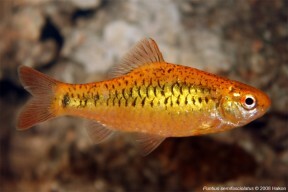 This species is also known by the alternative names ‘green’ or ‘Chinese’ barb. 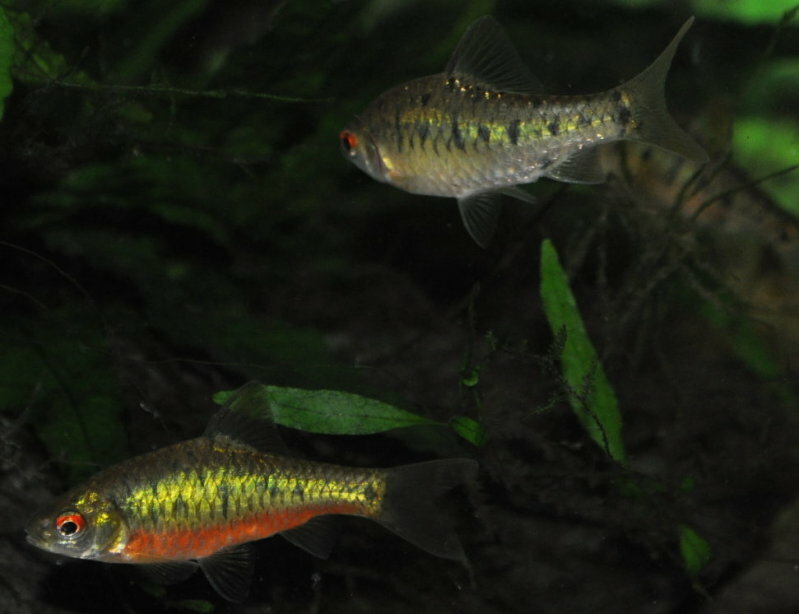 The natural ‘green’ form is an infrequent find in the aquarium trade whereas the selectively-bred ‘golden’ variant is farmed in huge numbers and is among the most popular freshwater aquarium fishes. It was first produced in the 1960s and is now so ubiquitous that many hobbyists are unaware that it is not the natural form. Unfortunately the commercially-produced fish are largely inbred and evidently have been for many generations. The fins in particular seem to be reduced in size when compared with wild examples and other deformities are not uncommon. An albino form is also available from time-to-time. 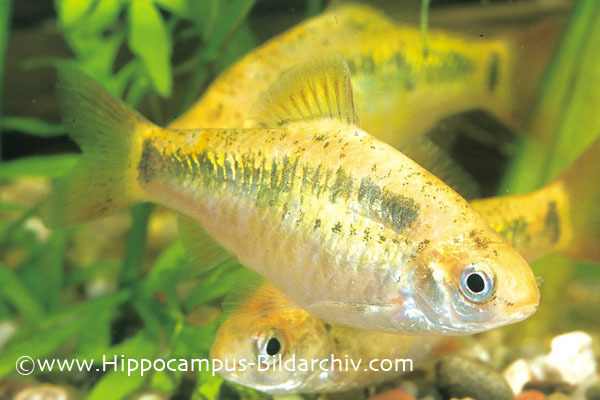 In aquarium literature the golden form is often referred to as ‘Barbus/Puntius schuberti‘ but this is not an official scientific name and was invented for American Thomas Schubert, who is credited with first developing the ornamental strain. Puntius sachsii (Ahl, 1923) is also in common use, but its validity is in doubt and it’s currently considered an ‘uncertain’ synonym of ‘P.‘ semifasciolatus. Puntius snyderi Oshima, 1919 has been considered synonymous with B. semifasciolatus but is currently treated as distinct. 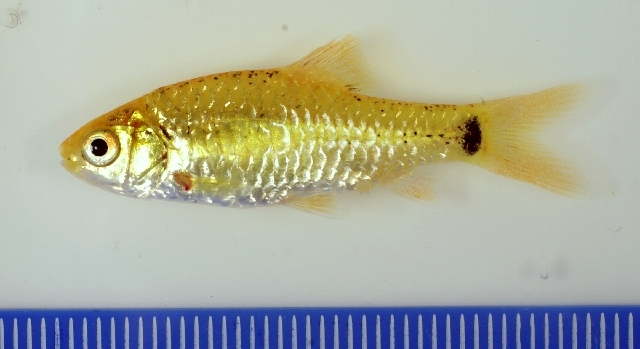 Kottelat (2013) published a comprehensive nomenclatural update for Southeast Asian fishes in which this species was among a number of former Puntius transferred into the genus Barbodes, albeit tentatively since B. semifasciolatus “may represent a distinct lineage”. 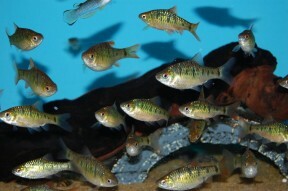 Members are told apart from related genera by the following aspects of ontogeny and colour pattern: small juveniles have 3-5 dots along the midlateral scale row, including one at middle of caudal- fin base, and an additional one at dorsal-fin origin; with increasing size, the spots on midlateral row may become more numerous and may fuse to form a stripe or broad band, and the spot at dorsal-fin origin may become a large blotch or a broad bar. Catalogue of the Physostomi, containing the families Heteropygii, Cyprinidae, Gonorhynchidae, Hyodontidae, Osteoglossidae, Clupeidae,... [thru]... Halosauridae, in the collection of the British Museum. 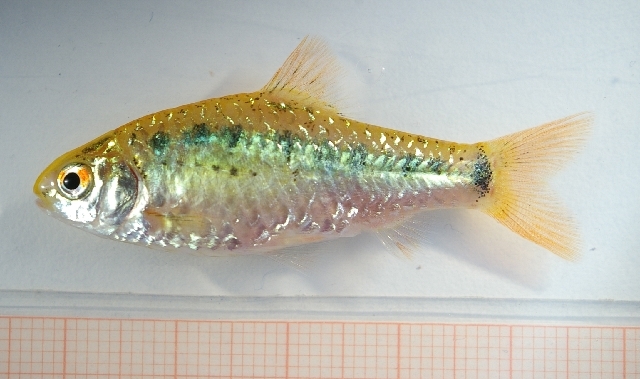 Molecular Identification of Two Sibling Species of Puntius in Taiwan. A Photographic Guide to the Inland-water Fishes of Taiwan: Vol. 1 Cypriniformes. I am lucky enough to have sourced several specimens of the wild form of this fish and I can truly say that they are even more beautiful than the hybrid form,once they have acclimatised themselves to the aquarium.With their metalic green cordal line and reddy brown fins,truly beautiful and well worth the effort to source this beautiful fish.Cheers,norjean09.